Cloned from Ninja Gaiden (NES) (Alternate) by Patrick Lauke (redux), Ninja Gaiden (NES) by Patrick Lauke (redux). Recreation of the in-game pixel font from Tecmo's "Ninja Gaiden II: The Dark Sword of Chaos" (aka "Shadow Warriors II: The Dark Sword of Chaos", 1990) on the NES. 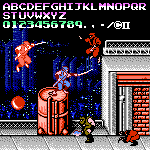 This font is very similar to the alternate font from the original Ninja Gaiden (though in that game it was used during the animated "Tecmo Theatre" cutscenes), with some minor differences in the "C", "S", "1", "6", the copyright symbol and the roman numeral "II". In contrast, the in-game font from "Ninja Gaiden" is used here for the cutscenes instead. Only the characters present in the game's tile set have been included. Info: Created on 18th October 2015 . Last edited on 18th October 2015.